So, if you had told me about this one pre-parenthood, well laughter wouldn't have covered it. CBeebies has released a 50 track, 2 CD collection of the favourite programmes of CBeebies as well as some of the songs which feature on the channel. This has already proven to be a bit of a lifesaver as, whilst the boys are happy to bop to most of mummy's favourite CDs (The Killers, All American Rejects...), Squeaks is very much more selective- her favourite song of all time being "The big bad wolf". As we did a series of visits last weekend it quickly emerged that not only was no-one tired, but no-one was really in the mood to be travelling round in the car. Now, admittedly, the children didn't know the majority of tracks on the CD, they have their favourites which are fortunately interspersed throughout the CD (In the Night Garden, Mike the Knight, Mr Bloom's Nursery), and this actually ended in a great game with Sqeaks of "guess the tune". Squeaks quickly got the hang of this (?! )- when she didn't know the track she just pretended the first line of the song was it's name- which in my world was great for her distinguishing the lyrics. Mummy was pleased, her favourite "Goodbye Sun, Hello Moon" is on CD1, although this didn't have the same impact early afternoon as it does at bedtime. The CD really helped us through Saturday. On Sunday Mr J joined us- unfortunately CD2 has 64 Zoo Lane's theme tune- ooooh how to upset Mr J- a song which always gets stuck in his head. Fortunately for everyone else, Mr J singing it under his breath everywhere we went. keeping everyone giggling at his expense! With 50 songs on the album it really is a worthwhile purchase, as background music whilst the little ones are playing, but more usefully for in the car this really is a much needed essential for harmony whilst driving. And I get to offer you a chance at harmonious car journeys! 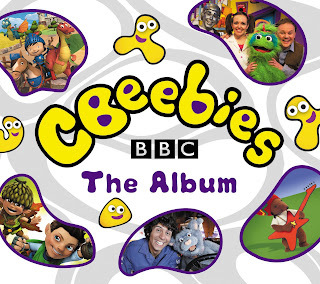 Just fill in the rafflecopter form below for your chance to win your copy of the CBeebies album! 1. This competition is open to residents of the UK, except for those associated with the company, their families or anyone else associated with this competition. 4. One entrant shall win a CBeebies Album. 8.Johnson Babies is responsible for the first part of the promotion, which is the publication and adjudication of the competition. All other facilities connected with the provision of the prize are the responsibility of the Promoter. Disclosure: I received a copy of the CBeebies Album for the purposes of this review. All views expressed are my own. I have received no financial compensation in bringing you this competition. 64 Zoo Lane gets stuck in my head too. And Little Charley Bear. I'd listen to it just to get the Teletubbies song out of my head. 64 Zoo lane but the Autumn song at the moment is a favourite.